First, about main foods. Australian foods are actually almost the same just like American foods. There are burgers, bun, meats, but also pasta, scrambled egg, french fries and onion rings. For recommended restaurant and bar, try Rogue Bar & Bistro, located in Austin Street. This bar and bistro will offer you very delicious taste of truffled scrambled eggs and onion jam. Totally suits for breakfast or lunch session. Not only that, if you want to try Itallian foods with a touch of Brisbane taste, try Alchemy Restaurant located in Eagle Street, Brisbane City. So many exclusive and great menus such as fettuccini pasta, mushrooms and spaghetti. Very recommended for your dinner event together with lover or your big friends. What about cakes and snacks? Brisbane also famous for the cakes and snacks collections such as buns, doughnuts, breads, french toast or soft cakes. One of the biggest recommendations for cake is red velvet. So many places that offer cakes such as red velvet and buns, the best one is Goodness Gracious Café located in Graceville. 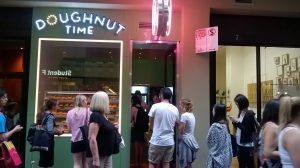 For a fan of doughnuts, Doughnut Time café located in King George Store and Grey Street can be the best considerations. So many sweet doughnuts there with lovely and unique toppings. Lovely time for breakfast or lunch! Last but not the least, about chips and snacks in Brisbane, one recommended place is Wacol Snack Bar located in Wacol Station, Brisbane. Only to fill your empty stomach or to have a big lunch session, this place is totally comfortable for your food guide. Besides Wacol Snack Bar, there is also Royal Snack Bar for your alternative place. So, what do you think after all? Which foods you will taste first after you come to Brisbane, Australia? It’s all up to your decision but we will guarantee you will love to experience all these Brisbane foods. Especially because all prices of those foods are not really expensive but so affordable. Good luck and enjoy to eat!